This tropical kale salad is packed with healthy food! Peel and chop 2 of the oranges and juice the third. Remove pom seeds from the pomegranate. Wash and chop kale into bite size pieces. Massage kale with olive oil and salt for 2 minutes. 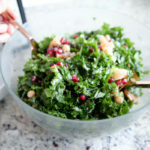 Toss kale with orange segments, pom seeds and chickpeas. Add orange juice and vinegar. Toss to combine. Season with black pepper and any additional salt. Toast macadamia nuts until fragrant and add on top of salad.